Traditional Indian Wedding Dresses are believed to be the most glamorous and most colorful wedding dresses in the whole world. The red dresses are customary for the Indian Brides but since taste is changing over time, nowadays many brides like to consider different colors for their wedding. 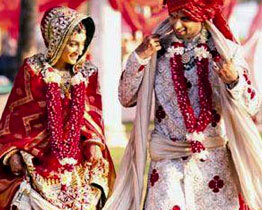 The wedding dresses worn by Indians are very different from the western style of wedding dress. Actually Indian bride is expected to sparkle on her special day, so the Indian wedding dresses are usually very colorful with intricate designs and embroidery. 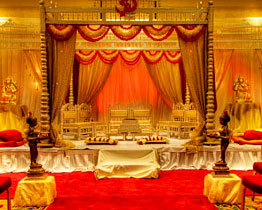 If you are Getting Married in India you should definitely have a look into the details of a traditional Indian Wedding. Indian wedding dresses for the brides are generally red as this is the color considered to be associated with good luck and is believed to bring the couple much happiness in future life. 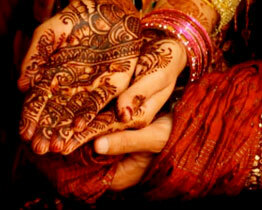 Indian wedding dresses are often a combination of intricate patterns, threading, sequences and beadwork. 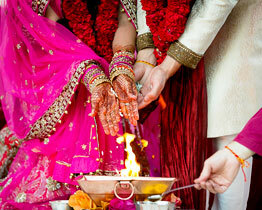 The Indian wedding dresses are usually made of a fabric that reflects light well such as satin, silk, or chiffon. The wedding sari can been beautified with awesome embroidery and embellishment work like zari, organza, zardosy, sequins, cut work, mirror work, pearl work, kasab, kundan work etc. Whether you are a habitual lover of sari or not but on that day the most loved ensemble in your wardrobe is supposed to be this piece of beautiful 9-yard cloth, your bridal sari! In-fact, more than just a gorgeous outfit, the Indian wedding sari holds a lot of emphasis in the Indian tradition. Other accessories available with Indian wedding dresses are necklaces, bracelets, rings, earrings or hair decorations on an Indian bride. It is all part of the bride on her wedding day. There is such an incredible amount of cultural and religious diversity in the Indian sub-continent that the exact style of Indian wedding dresses will vary from region to region. However, some common styles include the sari, gaghra choli and shalwar kameez. Sari: A sari is a length of cloth that is wrapped around the body in an intricate pattern. The length of cloth that remains after the sari has been wrapped is called the pallu. Ghagra Choli: A gaghra choli usually consists of a very long skirt and short blouse. A lengthy scarf called a dupatta is draped across the chest. Shalwar kameez: A shalwar kameez is a long tunic over pants, also with a dupatta draped across the chest. Depending on the bride's preference, the dupatta can also be worn around the neck, over the head or pinned to one shoulder on the side. Along with the wedding dress, there are certain elements of wedding wear that are essential to an Indian bride to make her feel complete. These accessories include necklaces, bracelets, rings, earrings and hair ornaments, all worn at the same time! This type of extensive ornamentation is a traditional part of the wedding. Additional accessories include shoes, handbag and flower garlands to be placed around the neck. Red continues to be a favorite for Indian wedding dresses. Red is considered to be the most gorgeous color fit for an Indian woman. Newer and softer shades of red are slowly but surely making their way into the Indian bridal collection. Also, designers are offering a greater selection of Indian wedding dresses and jewelry with a more delicate design. Another interesting trend is the fusion of Western style with traditional bridal themes. Some modern brides are choosing to pair cleaner lines with the traditional elaborate style of previous generations. The salwar kameez and Lehenga Cholis are great alternative for western brides. Indian bridal wear like Shalwar Kmaeez and Ghagra Cholis look great on all bodies. The salwar kameez comes in many different styles. The most interesting fact about shalwar Kameez as a bridal wear is that salwar kameez is often less expensive than other wedding dresses like saris. In addition, the salwar kameez, unlike more traditional wedding dresses, can be worn to other functions such as parties, semi-formal events and even work so the expenditure for it doesn't go for a waste. Another example of Indian bridal wear that looks great on any size is the lehnga cholis. Brought to India by the Moguls thousands of years ago, the lehnga cholis is a skirt and blouse combination that is rapidly becoming a favorite in Indian bridal wear. The lehnga cholis is dressy enough to be worn as a wedding dress yet can also be form to other formal occasions. 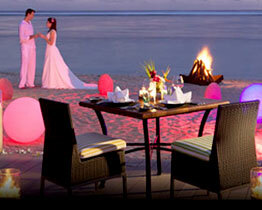 Planning a Wedding trip to India? This has become a most common practice for the NRI s and even for the non native ones from abroad who are in love with Indian culture or inquisitively want to touch up their special day with some unique features.